When love is not possession, but participation, then it is part of that co-creation which is our human calling, and which implies such risk that it is often rejected. We kicked off our very own ‘irrational season’ this weekend with the first big function of the summer. 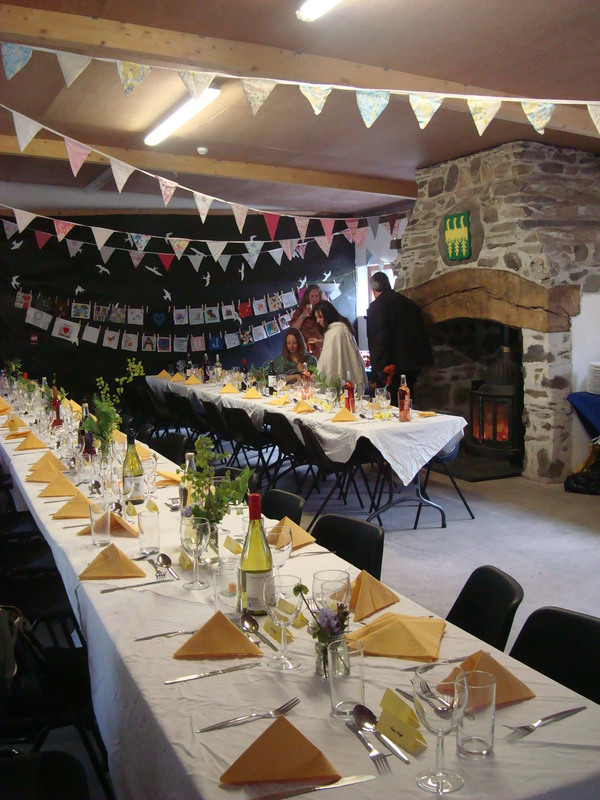 Jonathon and Viv’s wedding was held at Nant Gwynant, a campsite with a stunning complex of converted barns in the middle of North Wales. The beautiful, dramatic, lakeside location is undeniably scenic, surrounded by a circle of craggy mountain peaks rising and falling and is the perfect backdrop for a wedding. Having said this, the location is not for the faint hearted and only the brave and hardy would take a risk on the weather so early in the season. This is because the ample guest accommodation is in tents, camper vans or the bunk house above the barn! You could reasonably predict that a mid-summer wedding would have warm dry weather, but not so early May. Luckily for the wedding party the weather was good to them. It was dry and mostly sunny, although the temperature was not so forgiving. 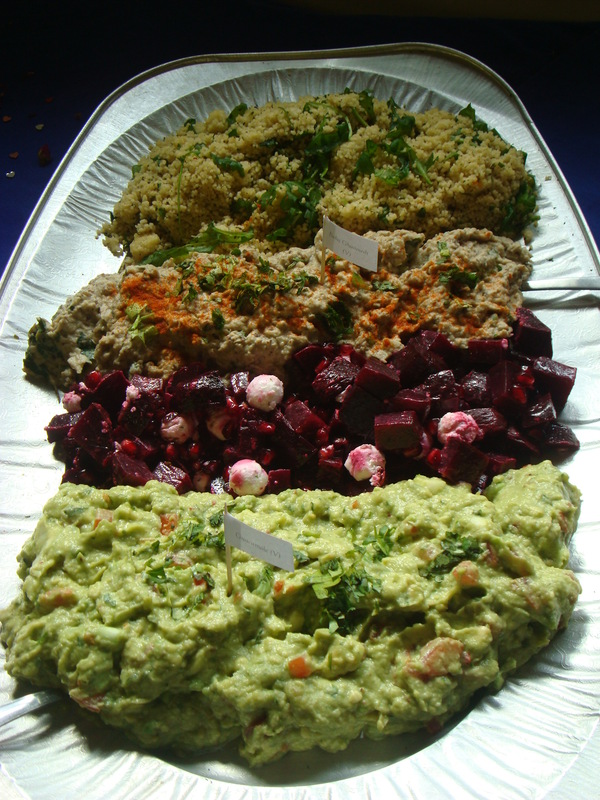 We all shivered even in the kitchen where our hands went numb chopping tomatoes and avocados. Eventually we decided to light the open fire which warmed us up a little. In the main barn a fire roared, but it needed a room full of bodies to really stop it being so chilly. 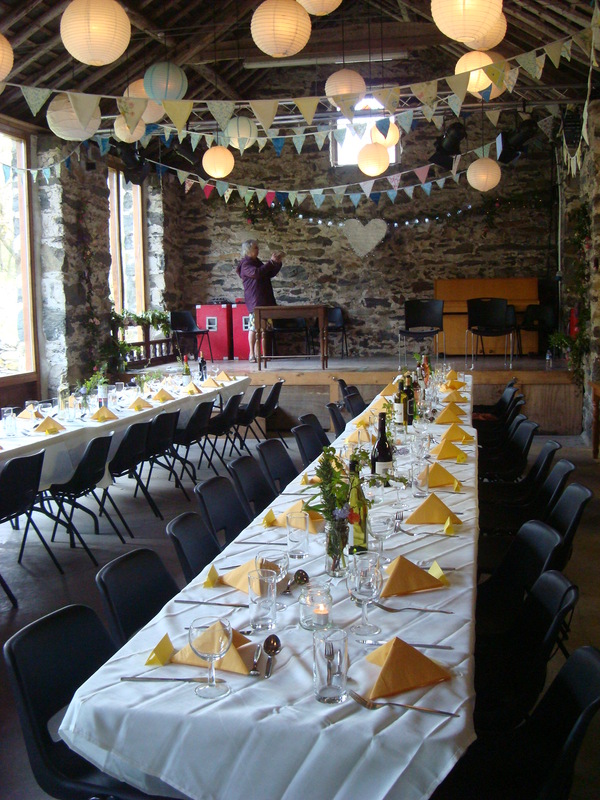 The hall and kitchen acted as a wind tunnel funneling an icy breeze through the building. Ladies in strappy dresses shivered, including the bride who looked beautiful in her blue flowered dress but stood wrapped in a cosy shawl by our kitchen fire as she took a few moments to compose herself. I didn’t envy the guests their tents. 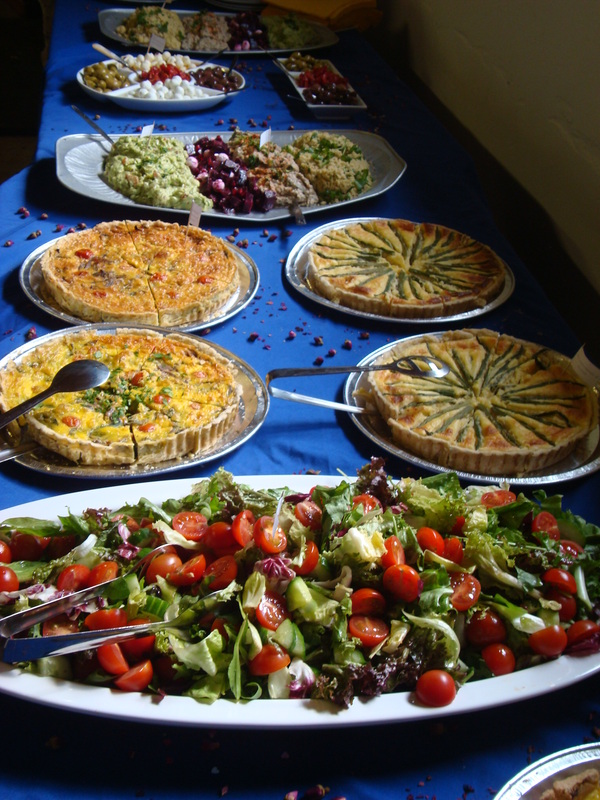 The menu for the event was a two course vegetarian feast for 100. The bride and groom shunned the meat since they and lots of their friends were vegetarian, opting instead for a hearty choice of universally popular Vegetarian favourites and a few specials of my own. I made so many tarts I was sick to death of rolling pastry….Nantmor wild mushroom and thyme; asparagus and parmesan; tomato, red onion, basil and Welsh cheddar; Savory tatin with potato, cherry toms and feta from Y Cwt Caws, garden herbs and wild garlic with feta and a section of very hearty salads…..oasted beetroot, goats cheese and pomegranate, potato salad with French dressing, Moroccan couscous with fresh herbs, roasted vegetables, sun dried tomatoes and toasted pine nuts, Green salad, Italian farro with pesto (pearled spelt) salad. Guests baked cakes to bring for dessert, each labelled and served on one of what seemed like a hundred cake plates.I briefly wondered where they’d got them all. Surely no one person can own so many! 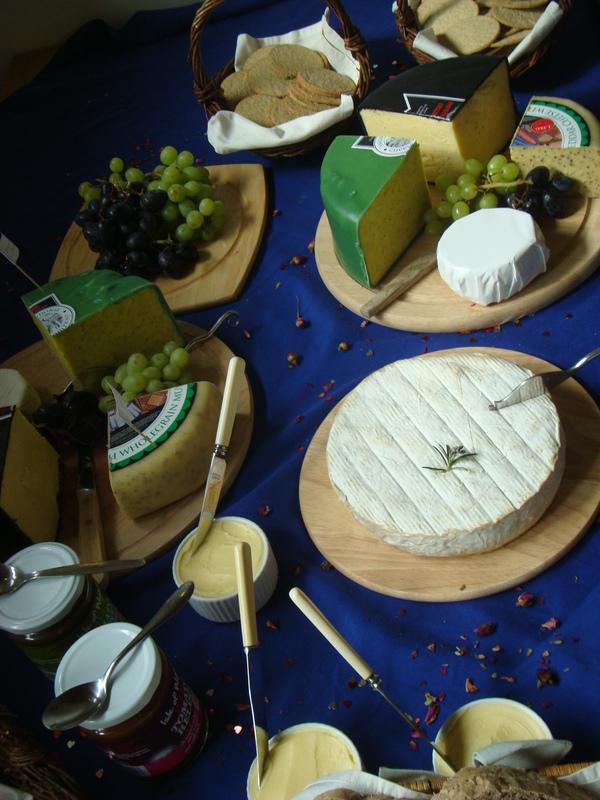 We provided the Welsh cheese board served as either an alternative to cake, or an additional main course choice. On it were our favourites; Snowdonia black bomber, Green thunder, Y Fenni (mustard seed and ale), Camembert and Smoked brie from Derimon and green tomato chutney and red tomato relish from the tomato stall. 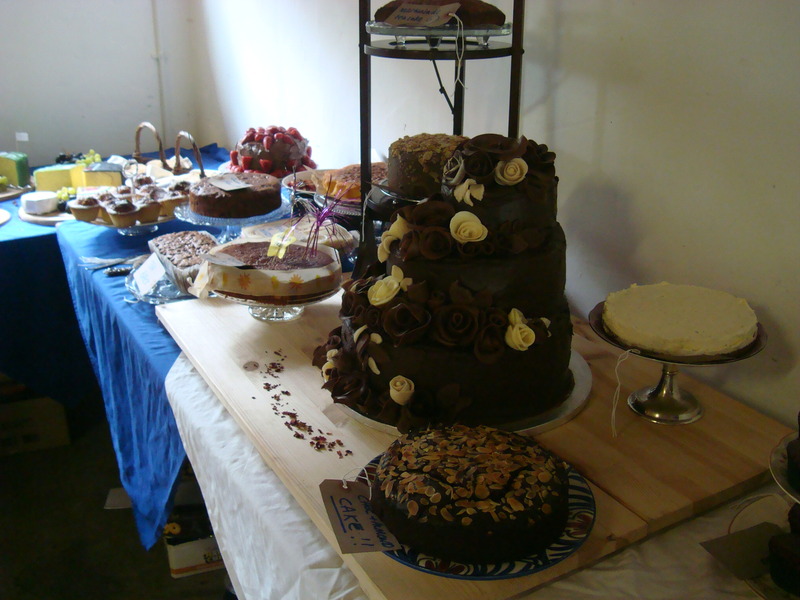 The piece-de-resistance was the enormous wedding cake. 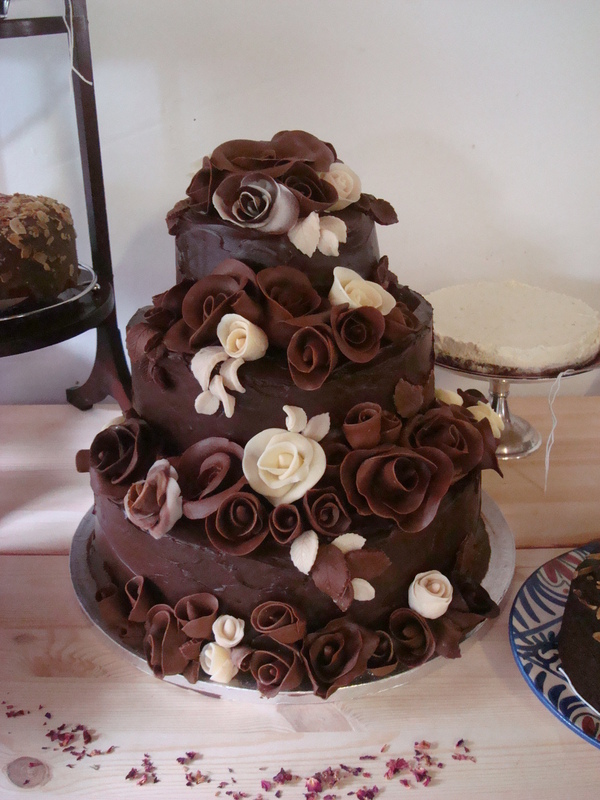 A huge three-tiered chocolate creation adorned with the most amazing chocolate roses. This is a skill I have yet to master being a rather heavy-handed chef so I totally admire those with the ability and patience to create such masterpieces. The meal finished with a selection of Clipper teas and coffee. that we realised we’d been a victim of our own success. We made enough for a hundred and thirty, but everyone wanted some of everything!! If the weather is a bit chilly people eat more. and one for me…try not to cut your finger so badly it needs stitching the day you are starting wedding prep (in the end I didn’t have time for stitches so it was constantly wrapped in blue plasters and plastic gloves…but it hurt like hell and still does). As we knocked off work and the guests (and my waitresses) ceilidh’d into the night all the stress melted away. I knew then we’d done a great job. The bride and groom were over the moon and we even got a round of applause for the food! I was extremely proud…How often does that happen at a wedding? Im glad you heard the round of applause! Oh, and the cake plates were from family and a few charity shops, I think we’ve started a collection!